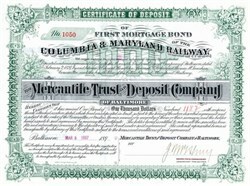 Beautiful receipt for bond deposited with Mercantile Trust & Deposit Co from the Columbia and Maryland Railway issued in 1897. This historic document was printed by A. Hoen & Co. Lith. and has an ornate border around it. This item has been hand signed by the Bank's Assistant Treasurer, and is over 114 years old.